Note: You can enter this giveaway three (3) times per e-mail address per day. Deadline is 11:59PM ET 10.18.18. It’s 6 p.m., do you know where (or what) your dinner is? 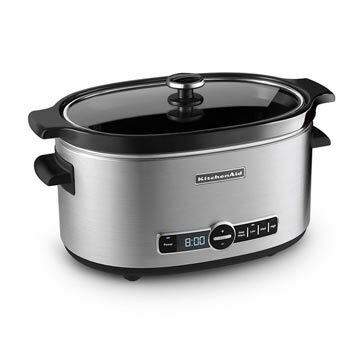 With the KitchenAid 6-Quart Slow Cooker you’d know the answer and probably be eating by now. This slow cooker is a perfect size for cooking for a family or making large batches of soup to giveaway or freeze for later. It features 24-hour programming and will automatically switch to a four hour “keep warm” setting at the end of the cook cycle, great for those days when you are running late. The ceramic insert is the perfect size for making this Coca Cola Brisket or Slow Cooker Cassoulet and is easy to clean, so you can get back to your busy life and planning tomorrow’s slow cooker meal. NO PURCHASE NECESSARY TO ENTER OR WIN. Void where prohibited by law. Open to legal residents of the 50 U.S., D.C. and Canada (excluding Quebec) who are at least eighteen years old at the time of entry and have internet access. Begins on 8.22.18 at 12:00:00 a.m. ET and ends on 10.18.18 at 11:59:59 p.m. ET. To enter the giveaway, submit your full name and email address on this form. Odds of winning this giveaway depend on the total number of eligible entries received. Only three (3) entries per email address per day. Sponsored by Leite’s Culinaria, Inc. For more information, visit our Official Rules. For a list of winners, check out our Very Happy Winners page. Be sure to add giveaways@leitesculinaria.com to ensure notification if you are the winner.